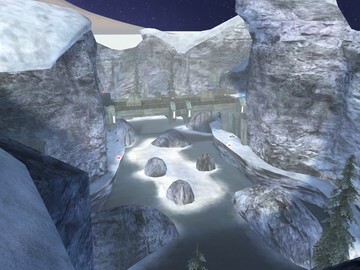 this is an AI map, play team slayer with everyone on red for best gameplay. ive blocked some places for longer game. needler:double damage and rate of fire. fuel rods: these got most of my editing. firstly, they are purple. second, it shoots purple shots instead of green, having a damage of 100 and a bigger explosion. but thats not all, watch out from the super needlers after explosion. all of classic weapons at spawn points and respawn fast. hen youre out of ammo, retreat to base. you can also use explosions to kill the other AI, and they cant respawn. there is a wierd portal noise which is annoying and it can be heard near the gaint doors sometimes.